Not only are sesame seeds a very good source of protein, manganese and copper, but they are also a good source of calcium, magnesium, iron, phosphorus, zinc and dietary fibre. Sesame seeds contain the highest total phytosterol content in the nuts and seeds category. 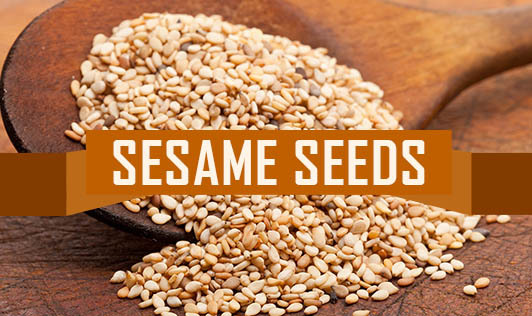 • Sesame seeds contain the highest total phytosterol content in the nuts and seeds category. Phytosterols are compounds found in plants that have a chemical structure very similar to cholesterol, and when present in the diet in sufficient amounts, are believed to reduce blood levels of cholesterol, enhance the immune response, decrease risk of certain cancers. • Sesame seeds are especially high in dietary fibre, therefore roughage in the intestines. • Sesame seeds contain sesamin and sesamolin, substances which prevent high blood pressure and protect the liver against damage. • Consumption of sesame seeds, especially black sesame seeds, gives relief to menopausal women as it helps in reducing menopausal symptoms like hot flushes, insomnia and irritability. Sesame oil is also sometimes recommended to alleviate the vaginal dryness problem associated with menopause. Myth: Consuming sesame seeds can cause miscarriage and can also advance menstrual cycles because of the "heat" from the seeds. Fact: There is no scientific evidence which proves that sesame seeds can have a negative effect on pregnancy or advance menstrual cycles. 1. Sesame seeds are used in several sweets including ladoos or sesame balls. 2. Sesame seeds can also be made into coarse nutty chutney served as an accompaniment to dosas. 3. The seeds can be sprinkled over bread before baking to give texture and taste. 4. In other cuisines sesame is made into sweet halva in the Middle East, flavours Japanese rice and is ground with garlic and lemon juice in the Mediterranean dip tahini.